Are falling government bond yields a good thing? Recent financial news has highlighted a paradox: as the US finds its credit rating downgraded, the extra it has to pay on its bonds to convince private investors to buy them have fallen. Yields of government debt – meaning the overall rate of return available on government bonds – have fallen, making it cheaper for the US government to borrow than before. A similar phenomenon exists in the UK: as the economy heads towards another recession, investors are keener to hold government bonds than before the ‘double dip’ recession debate began. 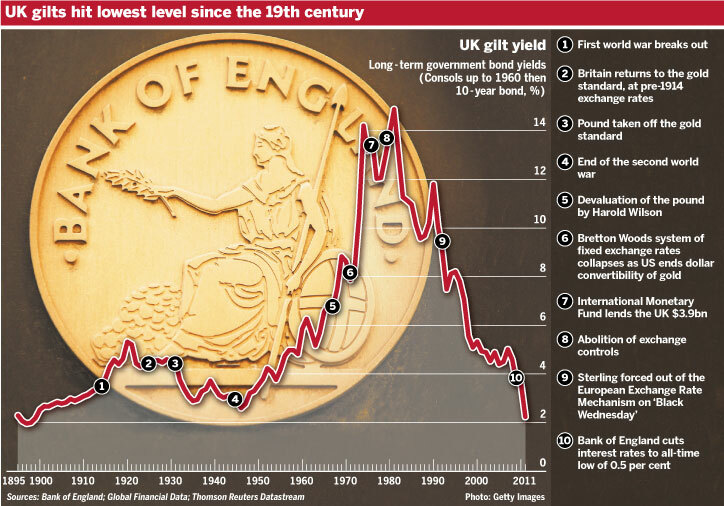 In fact, they are so keen to do so that yields on UK government bonds have fallen to a historical low (a hat tip to Lee Jones for the graphic). An obvious question to ask is why this is happening. Do private investors have secret information about the US and UK economies making their bonds particularly attractive? Not at all. The movement of bond yields reflects a change in sentiment amongst investors about the future of stock markets across North America, Europe and Asia. Investors increasingly think – based on bad economic data and ongoing crises – that stock markets will be bearish (losing value) for a long time to come. In comparison with that, government bonds seem like a reasonable investment. What are driving down yields are the poor growth prospects of OECD countries. In Switzerland, investors are fighting to hold government bonds whilst in Japan many are turning to gold instead of bonds, melting down individual gold holdings (jewellery, even teeth) to resell the gold as a way of profiting from surging gold prices. As ever, investors want to put their money where they will get a good return. If the stock market isn’t performing, the money will go elsewhere. Into government bonds, into gold, and anywhere else where there is a decent return. Another question is whether falling yields are a good thing or not. They are announced in the language of doom and gloom but presumably it’s a good thing for those governments who can now borrow at a lower rate. Compared to the borrowing problems of Italy, Greece and Spain, who are having to pay interest rates of up to 6% if they want to finance their borrowing on the international markets, the US and the UK can borrow cheaply. Doesn’t that mean that they can spend their way out of the current downturn? There are a number of problems with this. The first is that the lower yields are only part of what is otherwise a very gloomy picture. That government bonds may start outperforming equities is a trend associated with Japan over the last 20 years, prompting a debate amongst journalists, economists and analysts about the likelihood of ‘Japanisation’ of Western economies. In general, lower yields will not do anything to solve the underlying problems of an anaemic private sector. As is widely reported, a difference between today and the crisis in 2008 is that credit markets have not dried up and big companies are sitting on large amounts of cash which they have accumulated in recent years. But they are not investing it in a new round of capital accumulation. A second problem is about what governments should do if their yields are lower. This may undercut those arguing for the necessity of more austerity but even here the argument is increasingly nuanced. IMF head, Christine Lagarde, recently argued publicly for mid-to-long term government debt reduction coupled with short-term fiscal stimulus. The Financial Times recommended over the weekend that in place of universal fiscal retrenchment we should opt for an internationally coordinated move that includes fiscal tightening for some but not for all. It has finally dawned on policymakers that if everyone is cutting their spending, then the economy will bomb. But this takes us to an issue that we’ve discussed before on the Current Moment – the pros and cons of government spending. The technicalities are vast, as are the different options. The existing approach of quantative easing by the Federal Reserve in the US hasn’t worked. More controversial moves, such as job creation programs, have not been tried yet. There are many things governments can do to try to stimulate the economy but these will ultimately be determined by political factors. The options chosen by governments will reflect the balance of forces in society. The stock market downturn may make borrowing cheaper for some governments, but it will not change these balance of forces. In and of themselves, the changes we are seeing – falling yields, falling equity prices, fluctuating exchange rates – only become good or bad when placed within a wider analysis of the political economy of the current moment. Lower yields may seem to give some governments more options but given the state of play politically today it is unlikely that any of the more radical options will be chosen. Readers know the details: $1 trillion cuts, $1.5 more through a supercommittee with a trigger if they can’t agree, and the further possibility, by the end of 2012, that the Bush tax cuts for the wealthy sunset. Major spending cuts just as GDP growth was revised down for the past three years, and a double dip recession becomes an increasing possibility. In fact, stimulus money is just about dried up and, as we noted in a previous post, was considerably counterbalanced by contraction at the state-level. This plan looks less like a resolution to economic problems and more like a continuation of the trend of redistributing resources upwards: cuts in social spending (yes yes, some are protected, but not all, and it’s always revisable…) and preservation of tax cuts. There is a lot to say here, and we will try to do it succinctly, but to put the conclusion up front: this is not just a problem of a weak, neoliberal President and wacky-tacky right-wing, it’s also the product of decades of Democratic Party tactics and ideology. And more broadly, signals a deep, and not just American, problem facing left-wing thinking – this is an international, not just national story. Before getting to those points, a few minor observations. First, these cuts are, of course, revisable by future Congresses – a thought occasionally offered to placate critics, but there’s no reason why revisability softens the blow. Under certain political conditions, that could just mean programs like Social Security and Medicaid would get put back on the table. Second, there is a contradiction in the ‘success’ of the austerity project: contraction of federal spending is ‘procyclical’ in that it exacerbates recessionary tendencies. If it accelerates a recession this could hurt many members of the class that stand to benefit the most from the current arrangement – profits decline, bankruptcies loom, higher lending costs. Short-term gains, but long-term pain. Third, one of the promises Obamacrats have held out in support of this deal is that it puts the budget deal to rest and allows them to move to better territory – jobs. That is what Biden told unhappy Democrats. But this is not very credible. How exactly would a jobs program, or other major stimulus, work when transportation is on the chopping block and the administration has just, very aggressively, affirmed the need to control spending? One can’t shake the feeling that Obama is concerned about jobs up to and only insofar as he can use it to get re-elected. He hopes it is the symbolic issue that he can use to abuse Republicans in 2012, even if nothing very significant policy-wise actually comes out of the coming debate. Here we get to the nub of the issue. An excellent recent piece by Glenn Greenwald reminds us that Obama has always wanted significant cuts in social spending, and more generally been a champion of ‘entitlement reform.’ (Greenwald supplies the bulk of the evidence here). The key point is that Obama was not just pushed by nutty right-wingers, he has been a supporter of significant revisions to social programs for a long while. Of course, the plan may not exactly have been to Obama’s liking. And we can debate just how much Obama conceded versus got what he wanted (the best version of this debate is here), but most of this debate is besides the point. This budgetary compromise did not come to be in a vacuum. It is not just Obama but the entire Democratic Party that has been unable to provide convincing responses, and for good reason. For the past twenty years, the Democratic Party has been the part of austerity. The Clinton years have been celebrated as years of fiscal responsibility, whose crowning achievement was a balanced budget. The 1996 welfare reform entrenched the view that Democrats, too, thought there was a problem with the ‘culture of entitlement,’ and that individual households need to be more ‘responsible.’ The New Democrats also attacked the ‘old left’, echoes of Obama’s recent attack on the ‘professional left,’ and especially their tax and spend attitudes. Additionally, although it was Clinton who said ‘it’s the economy, stupid,’ it was the New Democrats who argued for a restructured role for the state in the economy. Their post-Cold War savvy told them the government should not try to do too much, correct market failures, alter incentives, but never compete with private industry (think recent health care reform and the rejection of the public option) and certainly forget about something as ambitious as a jobs program. No wonder the Democrats were unable to mount a very convincing case against the Bush era tax cuts, against cutting social spending, and against the stupidity of austerity on the brink of a double-dip recession. The neoliberal chickens of New Democracy have come home to roost. The political economy of New Democracy was, in fact, oddly contradictory. It was, on the one hand, the dream of a frictionless economy, spurred by the heady, speculative, but deeply inegalitarian dynamics of the ‘New Economy’ (whose myths have been decisively dispelled in After the New Economy). The post-industrial economy could grow on symbols, credit and knowledge alone. On the other hand, it promoted an ethos of limits: don’t expect the government to do what it once did, collective solutions to political problems are possible only on the margins, the individual must manage more with less. The government’s job is to keep things reasonable, like a balanced budget. The New Economy crashed (twice), and the Democratic Party was left holding the sputtering torch of its post-political economic theory. All that remains is its political (and funding) alliance with the new financial class, and decline of its former political basis in organized labor. No wonder, then, the Democrats have found themselves outmaneuvered. They have spent the last twenty years arguing against the ideas they suddenly hoped to trot out now – indeed against the very possibility of dramatic collective solutions to serious economic problems. Finally, as much as this drama has taken turns unique to the American political system, it is a particular example of a general trend. Last year’s British austerity budget included an average 19% four-year cut in departmental budgets, including cuts in pensions, education and transportation (the UK experiencing the familiar sluggish growth). Spain, Portugal, Italy, Ireland and especially Greece are all facing or passed austerity budgets, regardless of the kind of government in power – though in many cases with considerably more social protest than in the United States, and often with at least a slightly more equitable distribution of pain. Amidst 20% unemployment, Spain’s Socialist Party, for instance, cut spending 8% but included tax raises at the upper end. The general point is that the Tea Party added a touch of crazy, and Obama added a touch of ruling class cool, to a much more general problem for the Left. The mainstream parties of the Left, from New Democrats to Spain’s Socialists to British Labour, have been preaching austerity and a new era of limits for decades. In such an environment, austerity in a time of recession, extended joblessness, and growing inequality seems like the reasonable thing to do.